With Facebook executives focusing so much of their annual F8 developers conference on virtual reality, people are wondering how the technology will affect gaming and social networking. But good virtual reality -- the kind that makes you feel like you're really part of an experience -- will have a huge impact on business. For enterprises trying to differentiate themselves from their competitors, trying to connect with customers, trying to better show off their products and even make potential customers feel like they're trying out everything from a new car to a new iPhone before they buy it, virtual reality is likely to be a game changer for the enterprise. "Probably in the mid-part of the next decade we'll see the major part of this impact on the market," said Rob Enderle, an analyst with the Enderle Group. "You need the technology to mature enough and that will probably take about five years, and then you need another five years to adjust to it. So enterprises might really be putting this to work for them in the mid-to-late 2020s." Virtual reality is getting a lot of attention this week because the keynote during the second day of Facebook's annual F8 developer conference was largely focused on Oculus, a company that has built a virtual reality headset. Facebook bought Oculus in March 2014, and now the social network has big plans on developing not only virtual reality games but ways for Facebook users to communicate and share experiences using virtual reality. Facebook executives want users to even create virtual reality experiences for their online friends. Google is also known to be developing virtual reality products, though it hasn't specified exactly what it's doing. "Virtual reality done right truly is reality as far as the observer is concerned," said Michael Abrash, chief scientist for Oculus. "It enables us to create new realities. If it gets good enough, it should be able to create any experience we're capable of having." If Facebook's vision becomes a reality, that will mean big things for gamers flying virtual fighter jets or fighting in medieval times. What might it mean for the enterprise, though? Well, it should mean better communications with customers, a better way to show off new products and even a better way to work with employees. At this point, though, it's all about visions of how virtual reality might come into play in a business setting. Nothing is known for sure, but industry players are eager to try to figure out what might be coming. "Today, all the talk about virtual reality is just that, talk. Talk and speculation," said Jeff Kagan, an independent industry analyst. "And it will be several years before the first generation of virtual reality becomes real. Even then, it'll just be the first generation of virtual reality. It will be like bear skins and stone knives compared to what we will be using five years from then." And before an enterprise will be able to dive into virtual reality, there will be not only a learning curve but possibly a substantial investment to be made. Patrick Moorhead, an analyst with Moor Insights & Strategy, noted that companies will have to think about how they will support their virtual reality experience. They'll need to invest in the headset hardware, along with new software, likely upgraded computer power and an expanded datacenter infrastructure. However, with the wait and the investments needed, industry analysts say enterprises will be eager to see what this emerging technology can do for their business. "Like everything else, this would start as a competitive advantage for those early adopters," said Kagan. "Then, over time, it will become the way we do things. At that time, companies who don't do it this new way will be behind the eight ball." Here are a few examples of how the enterprise could use virtual reality in another five or 10 years. Trainers, according to Kagan, will use virtual reality extensively. "Whether training soldiers on a combat field or sales reps at the customer location, virtual reality provides the ability to enter the world to train and get better, without ever leaving your office," he said. "This would let every company be able to train every person, more often than ever. This would make every company more competitive." Soldiers, for instance, would be able to train in a virtual middle-eastern village or in a snowy, remote environment without leaving their American base. Financial managers would be able to train using a virtual office environment, so they could practice good communication and leadership skills. Virtual reality also should make for better relationships between employees working remotely and their managers or working groups. "Think about employees being able to work from home but, at the same time, working from virtual offices, surrounded by their virtual peers," said Enderle. "This could make the worker feel more like a part of the meeting or a part of the team," leading to possible productivity boosts. Another plus: "If you are more tightly coupled, it can be instrumental to make your boss more confident that you actually are working and not just goofing off at home," Enderle said. What will that mean for all those employees who generally work in their PJs or sweats? Well, if they use an avatar, they won't need to change their attire at all. Today, when most workers need to attend an important meeting -- whether it's in another corporate location or at a client's office -- they head to the airport, work their way through security and endure a plain ride, sometimes squeezed in that dreaded middle seat. Of course, some people use videoconferencing, but it's not widespread. And that experience still isn't quite like being in the same room and sitting down face-to-face with colleagues or clients. A virtual reality meeting could make it seem like a manager is in an actual face-to-face meeting when he or she is actually alone in the office. "Will this replace business travel? Nope, but it will reduce business travel as long as companies use it well," said Kagan. What companies will notice is a reduction in travel costs and in the administrative work it takes to make the travel arrangements and deal with the expenses. It also will reduce the amount of time workers are outside the office and unavailable. "It could lower travel costs because meetings in a virtual world could massively exceed what we can now do with videoconferencing," said Enderle. "Done right, this could actually be better than real face-to-face in some instances." Virtual reality wouldn't just help with avoiding flying to business meetings. Moorhead pointed out that it would be useful for scientists, maintenance workers or engineers working remotely. "What if you were an engine designer working with another [remotely based] designer to troubleshoot a problem?" he asked. 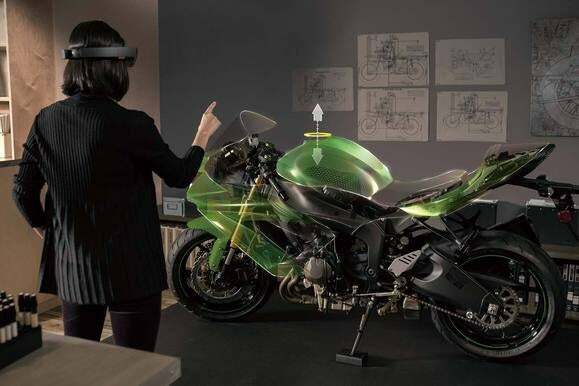 "With virtual reality, you could both walk around the engine, point out parts that need to be changed, outline specific changes and even make changes on the fly." If someone is interested in comparing two different types of smartphones before buying one, testing them both out via virtual reality would be the perfect solution. The same would go with someone looking to buy a new car, a new boat or even a house. Salespeople could help their potential customers to virtually try before they buy. Customers could feel like they're sitting in a car. They'd see how it would steer and feel on the road and how the interior looks up close. They could see how roomy it is -- all before taking the time to drive to a dealer to see it in person. "One of the bigger challenges sellers have is the time it takes someone to make a decision to buy something," said Moorhead. "This is driven many times by uncertainty and not feeling they did enough research. Think about if you want to rent a house or go on an expensive trip? You want as much information as you can get your hands on before you feel comfortable. With virtual reality, the seller could put you there so you could virtually walk through that house or hotel, more as if you were actually there." Kagan said one of the first uses of virtual reality may be at restaurants to allow customers to make their to-go food orders instead of calling in or using the Web. "Let's have some fun and imagine this," he said. "Instead of making a phone call, you can talk virtually face-to-face with a waitress at the pizza place. She can help you place your order. You can see the pizzas. Then as the technology continues to advance, you will be able to smell the pizza. It's just a better experience."